Meet @AJtheFiesta. He’s about to embark on a cross-country road trip from the University of Michigan to Silicon Valley’s Maker Faire and is set to blog and tweet during the whole trip. But he’s not your average Twitter user. He’s a 2011 Ford Fiesta. 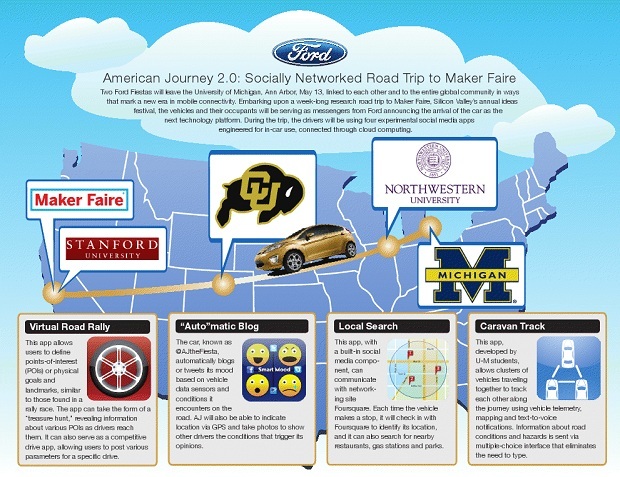 Ford turned to U of M a year ago and started what the auto maker called American Journey 2.0. The goal, it seems, was to reach out to the knowledge base at the university and discover what sort of social networking apps could be developed with the vehicle as the platform. The results are impressive and it’s going to be exciting to see them in action as two 2011 Fiestas make their way to California, showcasing custom-made apps along the way. A team of Ford engineers and another consisting of three Michigan students will make the journey. The Ford engineers will be using a sort of Geocaching-for-the-masses-type app dubbed Virtual Road Rally, which allows users to define points-of-interest along with physical landmarks and then come up with a sort of treasure hunt that can be shared. But it can also share fuel consumption stats and other info that can stir up a rally-type competition. Virtual Road Rally could lend its hand to tourism as well. In theory it can lead drivers to small towns or out-of-the way attractions. 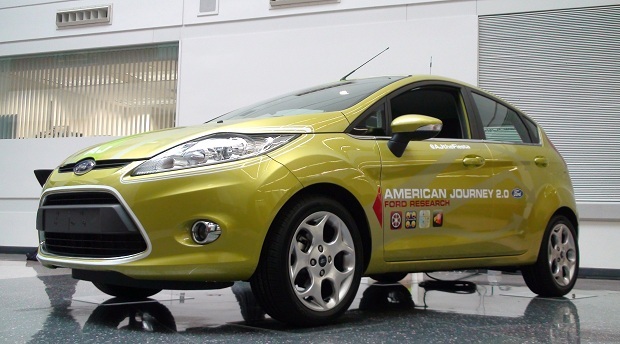 The Ford engineers’ Fiesta will also be tweeting and blogging along with using “Auto”matic Blog. It’s apparently connected to the cars vital systems and can automatically word a tweet based on all sorts driving conditions. The powertrain sensors – engine rpm, speed, steering inputs, g-loads, that sort of thing – can indicate to the car that it’s in one of those fun situations, and the car can then indicate that with a tweet or blog post. Similarly, if it’s at zero mph with the wipers on, the car might decide it’s sitting in traffic in the rain and send a sad tweet. Either way, we wanted to allow the car to become a blogger. These Ford geeks thought of everything. One of the cars will even use an app called Local Search. The name pretty much says it all, but it goes on step further with automatic Foursquare check-ins – seriously. Even the group of Michigan students lent a hand, coding their own app for this trip. Caravan Track automatically tracks the road conditions and other vehicles traveling together are experiencing. Perfect for this sort of drive where one car might be farther up the road and can send valuable road information to the trailing car. This app beat out five other options developed by other U of M students during a 12-week course developed by Ford and the university. The winning team are piloting the other Fiesta. Needless to say, these cars are socially connected and there are few different ways you can follow the journey. The official website has a real-time gas mileage chart along with display AJ’s mood (“joyful” as of this writing). And you can follow along on Twitter (@AJtheFiesta), where the car will automatically tweet a lot of the info along with occasional pictures from the car’s interior and front-facing cams. The trip will take about a week and includes a few stops at universities along the route. They will no doubt be showing off their hard work along the way. You might want to check it out too. Your next car might have this tech built-in. Big brother what?